A portal is an essential component of a modern GIS, and an inherent part of the Web GIS pattern. It provides a framework for sharing and using maps, apps, and data. It also supports identity, and provides the needed infrastructure to manage users, and how they collaborate. Many kinds of organizations across the world have implemented portals to support their needs and activities. I often describe a portal as the center of an organization’s geographic information ecosystem. It enables wider use and access to GIS data, serving GIS professionals, knowledge workers, decision makers, and developers as well as public access. A portal can be hosted in the cloud using ArcGIS Online, or hosted on-premises using Portal for ArcGIS. Portals can be publicly accessible, or remain private—viewable only after logging in. ArcGIS Online is a key component of the ArcGIS Web GIS platform. It is a comprehensive, cloud-based mapping platform that enables you to make and share maps and apps easily. ArcGIS Online provides cloud-hosted storage, management, 2D and 3D mapping, publishing, and analytic capabilities that you can use to extend your GIS and empower others. ArcGIS Online also includes the Living Atlas, a vast collection of curated and authoritative content, including basemaps, demographic layers, live feeds, and much more, that you can use immediately and apply to your mapping needs. What is a web map, and why is it important? These characteristics make web maps an important building block of Web GIS. Web maps, along with scenes and layers, are part of a new geoinformation model that abstracts the details of data sources, and makes them easier to use. This web map displays information from traffic sensors, highway incidents, and weather in real-time from across the Netherlands, processing millions of information transactions daily. 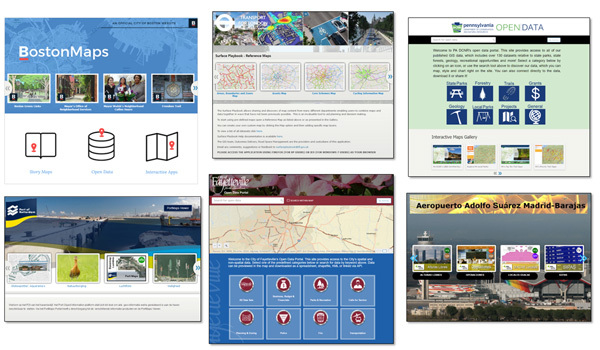 Web maps integrate a wide array of data, enabling you to integrate shapefiles, spreadsheets, ArcGIS services, services from ArcGIS Online, and the Living Atlas. Web maps are also the integration point for information from enterprise systems, Big Data, and the Internet of Things (IoT). Why is Web GIS important to me? Web GIS provides many more opportunities to provide broader access to your authoritative GIS data, enabling you to move your system of record to a system of engagement that facilitates everything from self-service mapping to making better decisions. It makes GIS more accessible, more affordable, and more pervasive. It amplifies the value of GIS, and the role of GIS professionals. 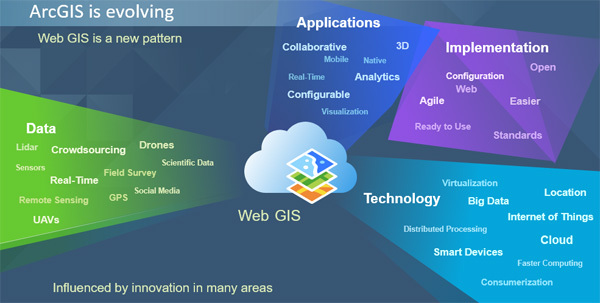 Web GIS is much more than a new trend, it’s the new paradigm for implementing a modern GIS. It’s fundamentally changing how we think about GIS, and the role of GIS professionals. The shift from client/server architectures to Web services enables us to connect to a world of information, from our enterprise to the Internet of Things (IoT), Big Data, and more. It pushes GIS forward into real-time mode instead of static data. Web GIS enables us to be more agile, moving from custom application development to configurable templates and web app builders. And most importantly, Web GIS moves us from proprietary data into open data and shared services that can empower everyone. If you’ve not done so already, it’s time to rethink your GIS, and consider the new opportunities and workflows that Web GIS provides. You can hear more questions and answers about Web GIS by viewing this video: 10 Questions for Esri: Web GIS.